"Half finger" design made with 200 series fleece. Advanced, optimized warmth without added bulk, Simms' Midweight OTC Sock is powered by a 75-percent merino wool blend that delivers moisture management and anti-microbial protection. Midweight over the calf engineering bolsters coverage while keeping your temperature range permanently tuned. Extended high-loft toes add warmth where it counts. And Right Angle® arch support improves overall support across rugged trail and river conditions. Made in the USA. Simms' go-anywhere Sports Crew Sock is a multitasking wunderkind powered by the absolute comfort of smooth flat-toe seams and plush foot-bed cushioning. A premium Merino wool blend retains warmth in subzero conditions, provides A/C relief when temps sizzle, and wicks unwanted moisture for chipper feet in all conditions. 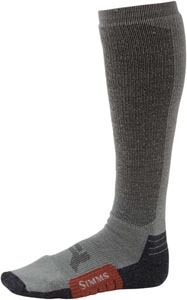 When it's time push past the concrete, wrap your favorite feet in the full cushioning of this best-in-class Wading Sock. Premium Merino wool retains warmth and wicks moisture with aplomb, while the 11-inch overall leg length reduces weight and makes for prime packability.